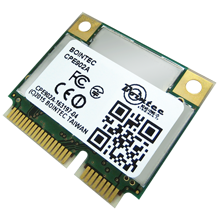 Bointec CPE902A included Atheros AR9592, is a single-chip, dual-band (2.4/5 GHz), 2-stream 11n solution. 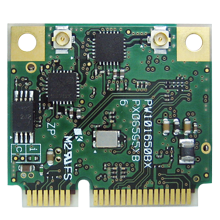 With miniPCIe interface.It packs the Atheros Signal-Sustain Technology (SST) that enhances rate-over-range performance. 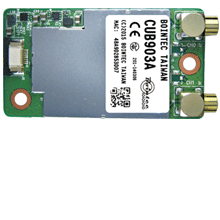 Features are enabled by 802.11n including LDPC, TxBF and MLD. Impressively increase in rate-over-range of ~+100% at short range, ~+50% at mid range and ~+25% at long range. 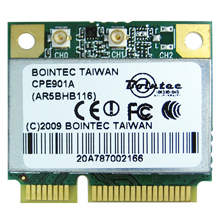 Bointec CPE902A consumes less power in every operation mode – active TX, active RX, idle associated and sleep than other Atheros previous chipsets.It keeps the notebook and other computing platforms running much longer on a single battery-charge, while providing TCP throughput of more than 200 Mbps when used in 2x2 mode. 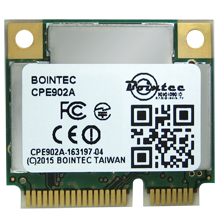 Bointec CPE902A is also optimized for Atheros Direct Connect™ P2P applications.With its Fast Channel Switch (FCS) feature, the channel switching time between the 2.4 GHz and 5 GHz bands is reduced from 10 ms to as little as 1 ms. This can be treated as the peak current consumption during operation. Frequency mask is marginal to comply with IEEE 802.11spec.